Formulas - a list of the formulas that you need to memorize to pass this exam, and a list of the formulas that you do not need. The CPCU® 540 exam is the fourth CPCU® exam in a series of eight required exams to complete your CPCU® designation. 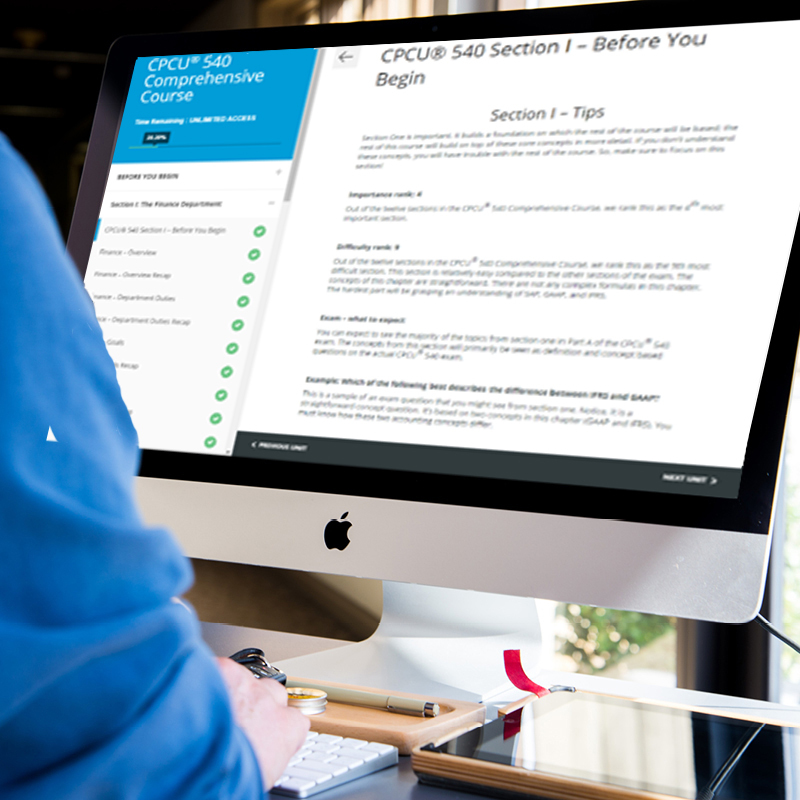 For more info about what to expect on the exam, see our blog about the CPCU® 540 Exam Overview. According to the National CPCU® pass rates, the CPCU® 540 is the hardest CPCU® exam with around a 70% pass ratio. The numbers don’t lie; the CPCU® 540 exam is the largest in terms of content (12 chapters) and is by far the most math-intensive of all the CPCU® exams. This exam will test your will to complete the CPCU®; many students get stuck on the CPCU® 540 and give up after failing a couple of times. 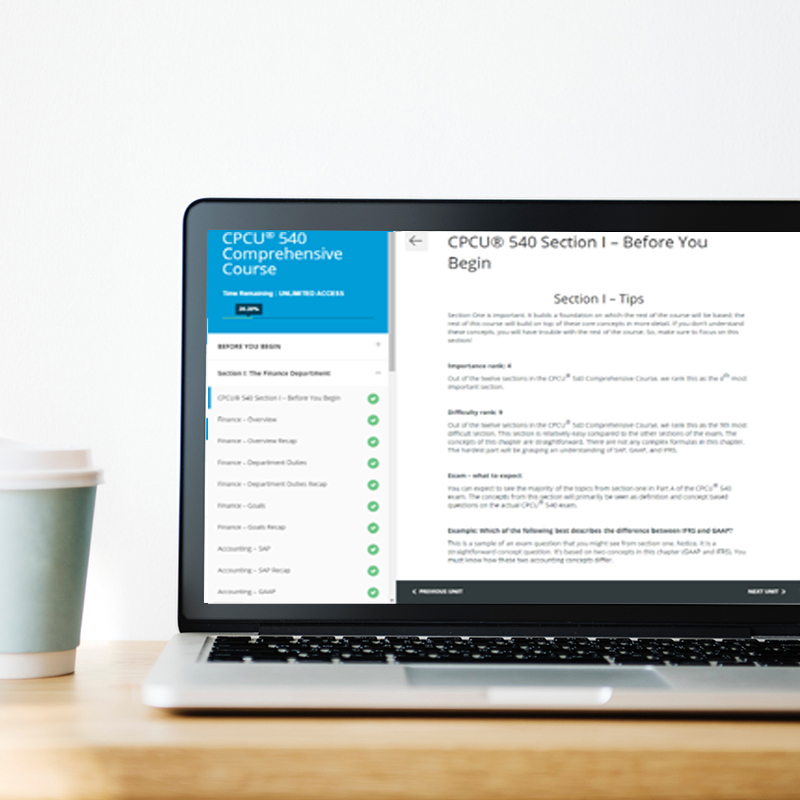 Prepare yourself now and set aside a little extra study time for the CPCU® 540 because there are a lot of new concepts to grasp and a lot of formulas to memorize. For more insight, see our blog about the CPCU® 540 Difficulty. The CPCU® 540 exam focuses on the topics of finance and accounting including financial statements, valuations, investment management and capital management. The reason this exam is so tough is because the questions are heavily math intensive. There are A LOT of formulas to know for the CPCU® 540 exam. According to The Institutes, there are 34 math formulas that you’ll be required to know to pass the CPCU® 540 exam, but we estimate that there’s closer to 80 formulas that you need to pass the CPCU® 540. Of these 34 formulas; 7 of them are provided to you at the exam (The Institutes will give you the formula) and 27 are not provided to you at the exam (meaning you’ll have to memorize the formula). In addition, The Institutes will provide you with 4 tables to use on the CPCU® 540 exam including: future value table, present value table, future value of an annuity table and present value of an annuity table. You not only have to memorize the formulas but you have to know when to use each formula and how to apply the formulas to a given case question. For more info about the most important topics see our blog about the CPCU® 540 Exam Important Topics. According to the exam, there are 34 formulas that are NOT given to you on the CPCU® 540 exam. Unfortunately, this greatly underestimates the actual number of formulas that you’ll need to memorize for the CPCU® 540 exam. According to our count, there are approximately 80 CPCU® 540 formulas that you should know before taking the CPCU® 540 exam. For more information about the CPCU® 540 formulas that you need see our blog on the Most Important CPCU® 540 Formulas. According to the National CPCU® pass rates, the CPCU® 540 is the hardest CPCU® exam with a 72.98% pass ratio. The numbers don’t lie; the CPCU® 540 exam is the largest in terms of content (12 chapters) and is by far the most math-intensive of all the CPCU® exams. This exam will test your will to complete the CPCU®; many students get stuck on the CPCU® 540 and give up after failing a couple of times. Prepare yourself now and set aside a little extra study time for the CPCU® 540 because there are a lot of new concepts to grasp and a lot of formulas to memorize. For more information, see our CPCU® 540 difficulty blog. For a full list of CPCU® 540 formulas, download our CPCU® 540 practice exam and list of formulas. The formulas are the most important aspect of the CPCU® 540 exam, in particular, the formulas and content from CPCU® 540 chapter 6 (Cash Flow Valuation) and CPCU® 540 chapter 7 (Bonds and Stocks) are crucial to passing the CPCU® 540 exam. For more information about exactly which chapter 6 and chapter 7 formulas are important, see our CPCU® 540 most important topics blog. According to The Institutes, there are 34 formulas that are NOT given to you on the CPCU® 540 exam. Unfortunately, this greatly underestimates the actual number of formulas that you’ll need to memorize for the CPCU® 540 exam. According to our count, there are approximately 80 CPCU® 540 formulas that you should know before taking the CPCU® 540 exam. For more information about the calculators you can use on the CPCU® 540 exam and how to get your calculator approved, see our CPCU® 540 calculator blog.